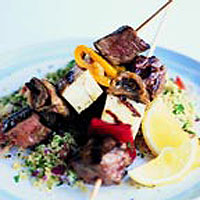 Thread diced lamb leg and halloumi cheese onto pre-soaked wooden kebab skewers, along with Waitrose Marinated and Grilled Aubergines and Waitrose Marinated and Grilled Red and Yellow Peppers. Drizzle the remaining oil from the vegetables over the kebabs and cook them on a hot griddle or barbecue until the lamb is thoroughly cooked. Serve with a herby couscous salad and lemon wedges to squeeze over.